Mom put her dinner on the table and went to change out the laundry. I took a 6 inch turkey sandwich out of the bag and wrapper and ate the whole thing. Posted August 1st, 2013 . Never leave food unattended when a beagle is in the room!!!! We learned that lesson the hard way… Also with a sub…. Could have been worse! Could have been a footlong! yeah my cocker spaniel ate my husbands sub while he was in the shower. It was on the table in the bag and she got it out and ate all but the paper and the onions. I set the christmas turkey outside to thaw quickly and went to church. ( I know, wrong way to thaw a turkey) During the Christmas eve service, I was stricken with panic as I realized the dog door was open. When I got home I found the still frozen turkey in the wrapper and plastic netting halfway across the yard. Fred, the beagle had tried to consume it. We had ham that year. I call that the beagle diet. 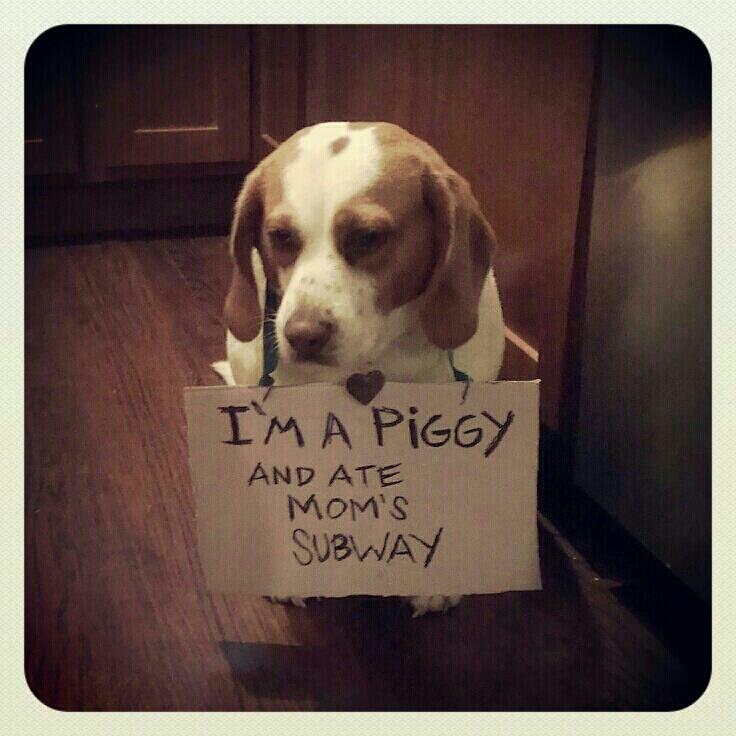 My beagle keeps me on a diet. Ah the Bumpus hounds! Our beagle one year came home from a walk with my dad with a 6 inch around, 18 inch summer sausage. Dad didn’t know why it was lost, but it was definitely found. We have photos…will have to get it on here someday! One year he stole the frozen ham. It was so cold and we couldn’t tempt him with anything to get it away from him. He actually carried it over to a throw rug, pulled the rug back and pushed his paw ontop of the rug which was ontop the ham. He made himself a freaking mitten. Literally.